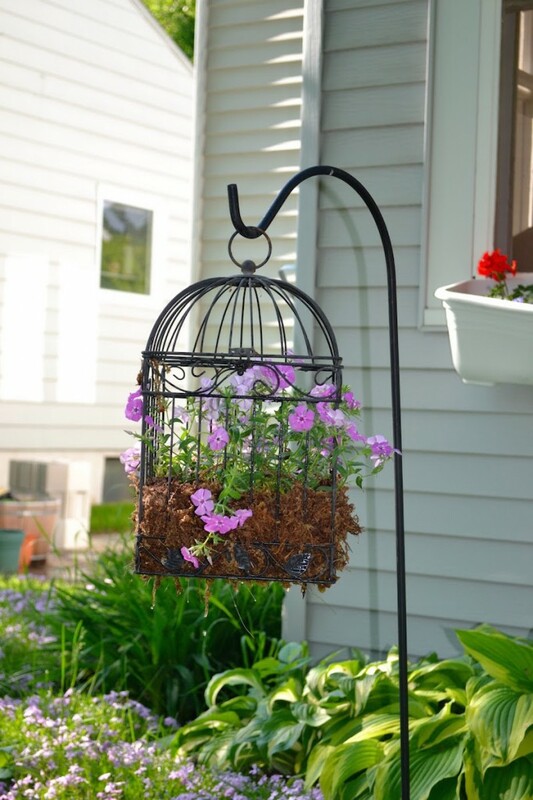 Bird cage planters always add an attractive element to your garden or backyard. 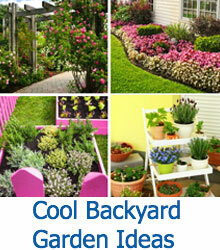 Browse through these do it yourself planters and implement one in your yard. 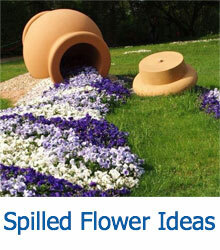 People have come up with all kinds of new and creative ways to plant flowers in their gardens. Whether you are using conventional planters, DIY crafted planters, or unique recycled planters, the most important thing is that you are planting something, and enjoying it as it grows! 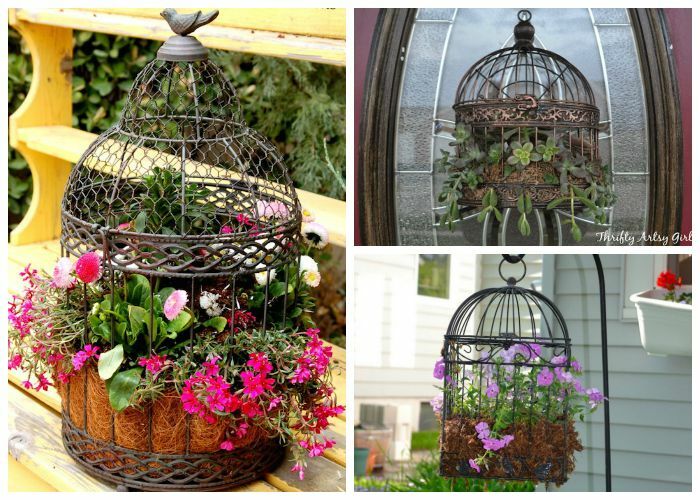 One of our favorite types of planter creations has always been birdcage planters. 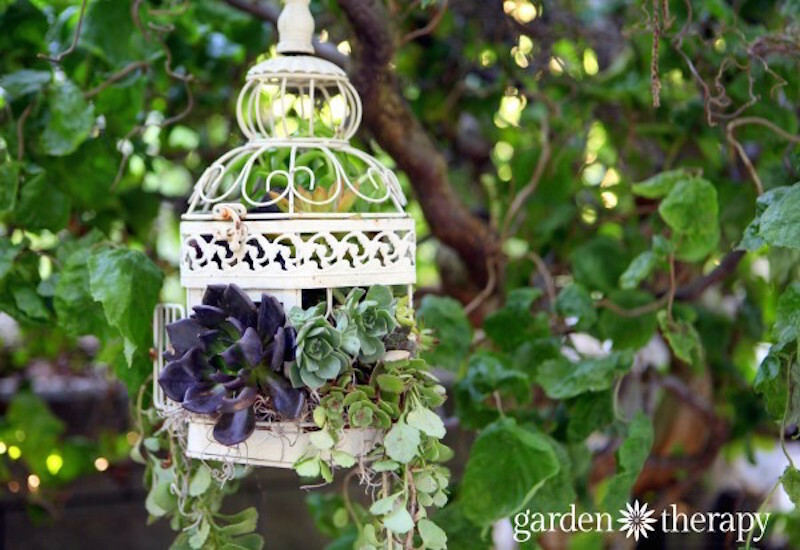 The vintage look of a birdcage hanging in a garden just has some attractive element. Maybe it has to do with the wires on the bird cage, or maybe its the plants that always seem to spill out from the sides. Regardless, it’s a look that we have come to know and love. We know that there are plenty of craft stores and convenient places to buy a vintage looking birdcage, but recycling an old cage that you have lying around will work just as well! The great thing about this type of design is that you have a virtually unlimited number of options for placement. You can hang the cage, mount it to a wall or front door, or simply place it on a flat surface. 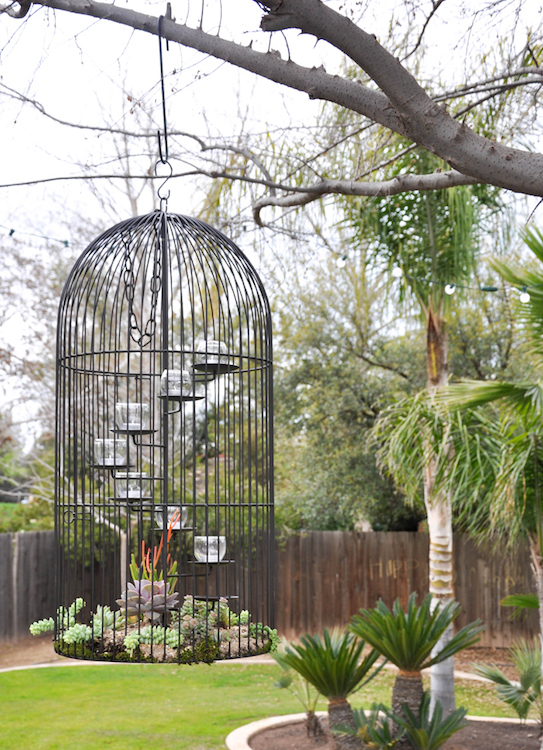 Take a look at these seven different examples of birdcage planters that we have gathered! Many of them utilize succulents as the plants inside, but don’t feel that your design has to be limited to that! Plants that hang and vibrant flowers are always great for these kinds of planters as well. This bird cage is made of thick metal bars, spread far apart from each other. The top of the cage opens up and allows for you to access the faux plants inside. The designer simply purchased her materials at a drug store gift department. We aren’t sure which drug stores she has been shopping at, but we’re sure that you can find similar materials at a craft store or grocery store around you! This design uses an actual birdcage built to house a feathered friend. If you used to have birds and have yet to get rid of the cage, consider implementing this design! Since the cage itself is so spacious, you can actually just use an already potted plant and place it inside. 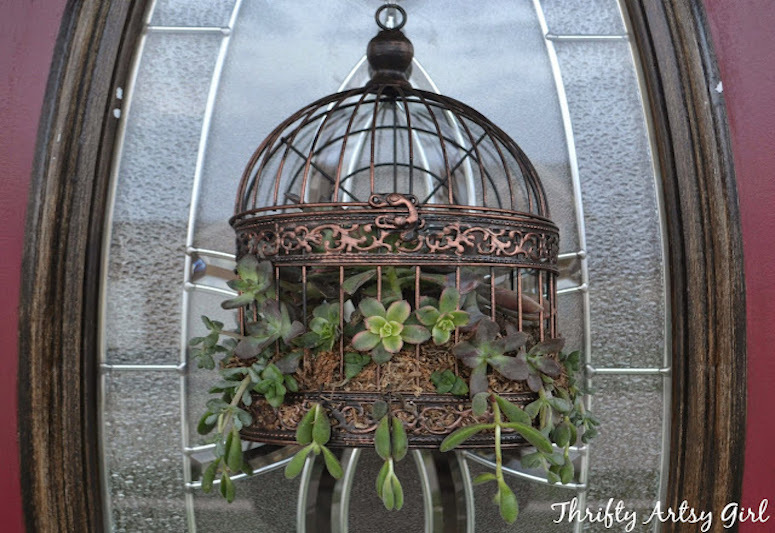 As you can see in other images of her blog, the designer has wrapped a burlap sack around the planter inside the cage, to give it more aesthetic appeal. This large bird cage is similar to the first image, in that it opens up from the top. The back side of the cage is flat, so that you can hang it on your front door or against a wall as a wreath. 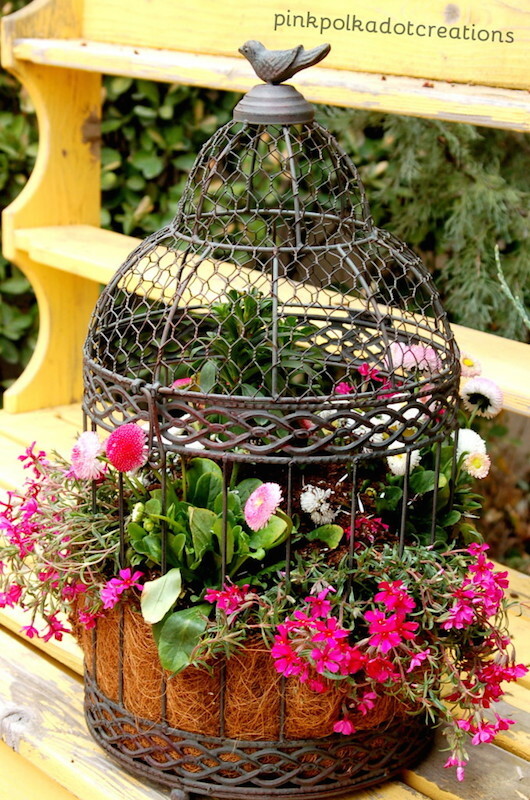 The designer of this birdcage planter put a lot of effort into its creation, and with her instruction, you too can have an impressive birdcage planter to hang in your garden or on your front porch! Visit Thrifty Artsy Girl to see all her tips and tricks for the planter making process. A similar design to other bird cages in this post, however, the top of the cage consists of thin wire rather than a thick metal. 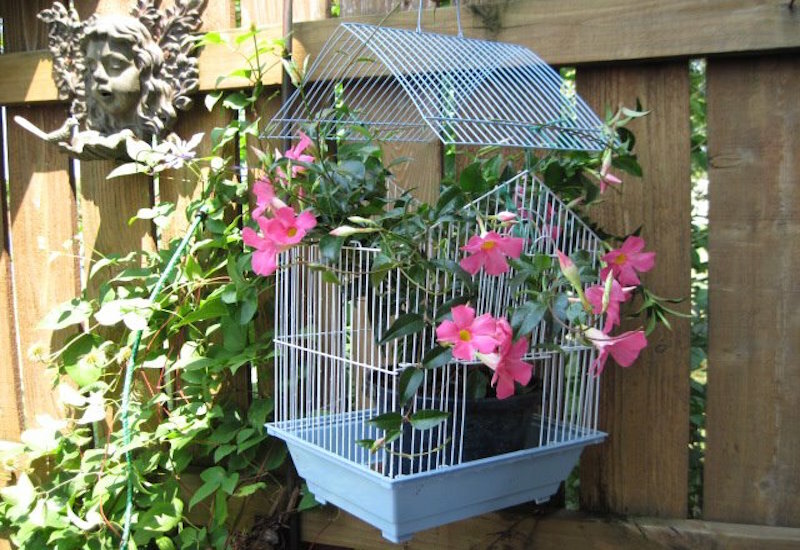 The designer has a very helpful blog with suggestions on how to make this birdcage planter, or one similar to it. 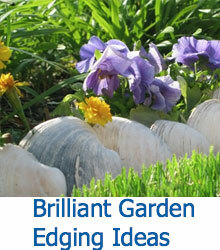 She also offers good advice on what kind of plants you will want to use for your cage. This bird cage is tall and thin. The wires are all thin as well and allow for good visibility into the cage without allowing all the contents to spill out. The designer has a great taste for aesthetic appeal, and using her ideas to create your own birdcage planter is a sure way to end up with a beautiful display of your own! This birdcage features wide openings, so if you have a cage similar to this, you will want to be sure to use plenty of cage lining (whatever material that may be) to ensure that your plants inside the cage don’t loose all of their soil. The designer for this planter details in her blog which materials she used, and has some great tips on how to work with each different material. This small birdcage is unique from the rest that we have featured in this post, in that it is white and has a elegant design, obviously made solely for decoration. 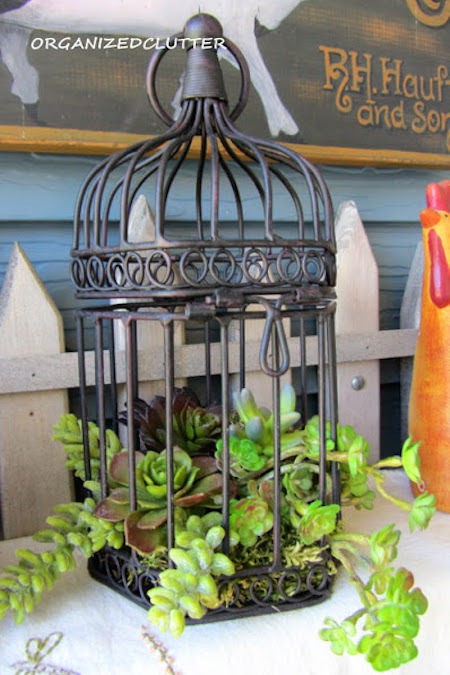 The large spaces between the wires in this cage allow for large succulent plants to bloom out from all sides. Not only does the designer give you a complete set of instructions on how to create a succulent planter like this one, there are also plenty of other resources to learn about gardening and planting on her site. In this video from socalgardenwiz, she guides you through the steps on how to create your very own birdcage planter.